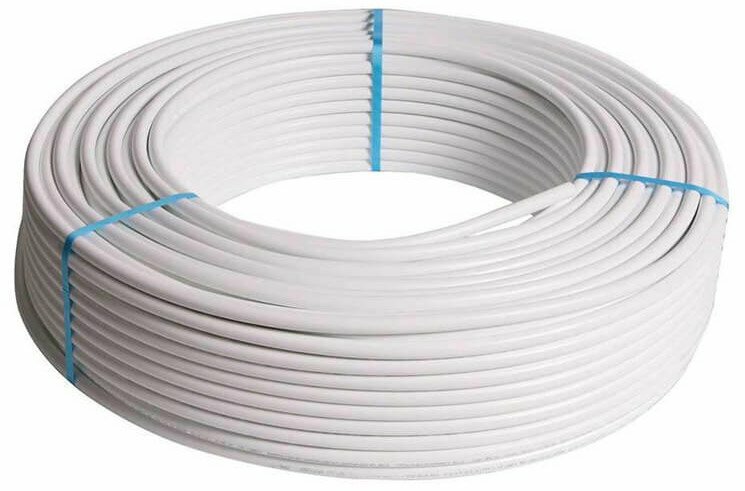 https://www.tradingdepot.co.uk/polypipe-ufh-solid-floor-room-packs 78308 Polypipe UFH Solid Floor Room Packs https://www.tradingdepot.co.uk/media/catalog/product/p/l/plusroompack.jpg 26.01 26.0100 GBP InStock /Heating/Underfloor Heating Systems/Hot Water Underfloor Heating /Brands/Polypipe/Polypipe Underfloor Heating/Room Packs /Heating/Underfloor Heating Systems/Hot Water Underfloor Heating/Underfloor Heating Packs /Underfloor Heating Room Packs /Heating/Underfloor Heating Systems/Hot Water Underfloor Heating/All Hot Water Underfloor Heating /Special Offers/Plumbing Offers Polypipe Solid Floor system offers optimum performance alongside quick and simple installation for solid/screeded floors. Choose from 12m2, 20m2 or 30m2. To complete your Polypipe Underfloor Heating system, why not add a temperature control. Please note if choosing a wireless thermostat you need to buy the PBRECRF receiver. Polypipe Solid Floor system, also known as Red Floor Panel system, offers optimum performance alongside quick and simple installation for solid/screeded floors. If you’re digging up floors as part of a new build, extension or renovation, you can install the system within the new floor. The lightweight floor panels are quick and easy to cut to size and lay. The Red Floor Panels also offer a degree of protection for the pipes after installation, allowing other workmen to continue working on site until the screed is poured, with a reduced risk of knocking the pipe out of position. The unique red floor panels are made from a lightweight plastic which are quick and easy to cut to size. The floor panels also fit into each other so can be easily carried or stored. The Polypipe red floor panels form a simple grid to ensure the fastest possible pipe laying and act as a guide for laying the ultraflexible pipe in the required spacings. The Polypipe Zonal Regulation Unit (ZRU) allows single rooms and extensions up to 30m² to be connected to an existing heating system. When connected to an existing radiator heating system, the ZRU converts the water flow and temperature to that suitable for underfloor heating. Please note zonal regulation unit may vary in appearance due to product upgrades. Designed for use in underfloor heating systems only, this ultra-flexible polybutylene barrier pipe lends itself perfectly to systems where ease of handling is essential, such as in solid floor pipe staple systems or fit from below installations. Ultra-flexible underfloor heating pipe allows more flexibility while installing which speeds up the installation process. 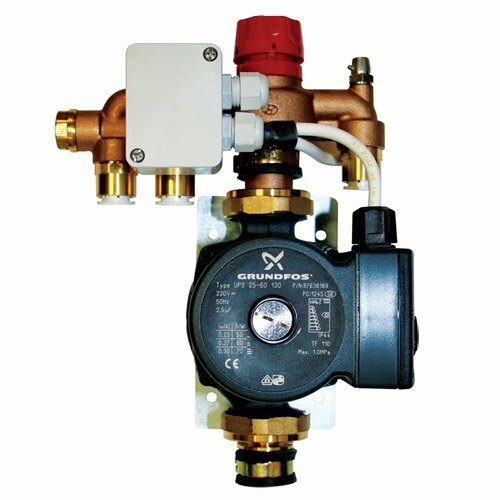 This can only be used on underfloor heating not standard hot and cold plumbing. Thermostats are an optional extra to finish off your underfloor heating, there's no need to wrestle with the dial to change the temperature with a thermostat. Available in a dial thermostat or programmable thermostat, wired or wireless. If using wireless thermostat you need to purchase the receiver. Dial Thermostat Finger indentation ensures the temperature to be easily altered to your desire, easy to use and very user-friendly. Programmable Thermostat Can make up to 9 adjustable programs to control the temperature, set the heating to come on just before you come home with the simple user-defined programming, no need to have it on all day unnecessarily. Polypipe Solid Floor system offers optimum performance alongside quick and simple installation for solid/screeded floors. Choose from 12m2, 20m2 or 30m2. 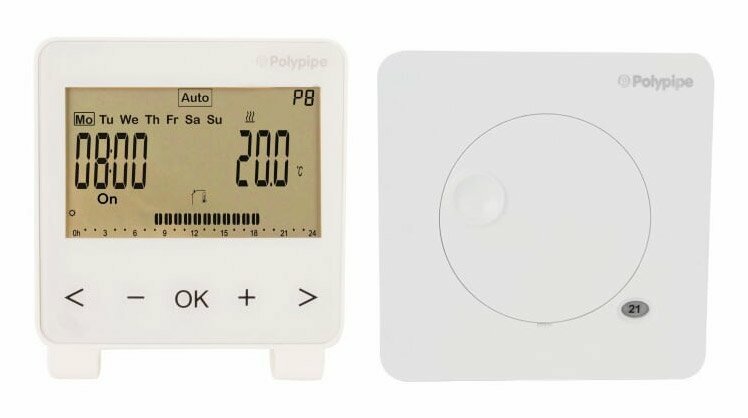 To complete your Polypipe Underfloor Heating system, why not add a temperature control.